PureJoy! Performing Arts considers it an honor to take part in the celebration of your child’s most special day. ~ 45 mins in the dance studio for a class set to music, dance, and lively creativity! ~10 mins – all parties end back in the dance studio for: Lights out, strobe light on, bubble machine whirling and music pumping! ~ We take care of serving food/drinks (you provide) and the clean up! ~ Parties are on Saturdays from 1:30-3:00. PureJoy! 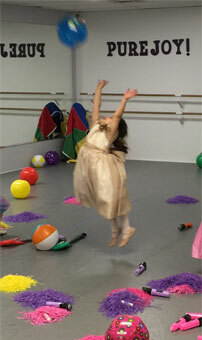 Performing Arts looks forward to making your child’s birthday celebration purely joyful!